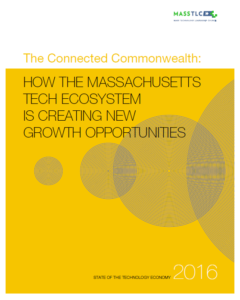 We appreciate your interest in learning more about MassTLC. By joining MassTLC, you become part of a diverse community of leaders and innovators, from startups and growth companies to global enterprises, all dedicated to advancing technology. Whatever your goals may be, our events, content and advocacy offer you the connections, knowledge, and visibility to get where you are going faster. In busine ss, who you know can make all the difference. When you plug into the MassTLC community, you and your team get connected with people you need to know to move your business forward. From tech leaders…to partners…to funders…to customers, you’ll find them faster. As a MassTLC member, all of your employees get access to knowledge and ideas that help shape your strategy. Your team can join any of our cluster communities and attend events that cover high-level trends and best practices for free or at the member discount rate. Additionally, they have access to a wealth of research and content. As a MassTLC member, your company receives opportunities to show your expertise and highlight your products and services. We consider members first for speaking opportunities, and sponsorship opportunities are only available to members. Plus, our cluster communities are so interactive, you get exposure simply by participating. MassTLC provides opportunities for your shining stars to be recognized as leaders in their areas of expertise. We offer roles that that give C-level members of your staff exposure to other executives and policy leaders as well as roles perfect for your directors and managers. MassTLC offers memberships to tech companies, IT departments of large enterprises, service companies (affiliates), universities and non-profits. Affiliate members: non-technology services companies, such as PR firms, VCs, consultants, staffing agencies, etc. All members have access to MassTLC’s communities and peer groups, research and cutting-edge content, event attendance, sponsorship opportunities, and advocacy efforts. MassTLC has allowed Cadence to tap into a world class network of tech companies and brilliant technologists in the Boston area who are facing many of the same challenges we are facing. This access has allowed us to bring new ideas into our company that are fundamentally changing the way we do business. Of all the industry associations I have been involved in, MassTLC has been the most fulfilling. It brings together the most innovative technologists on the east coast, from legendary inventors and CEOs to new college grads, in a genuine, friendly and thought-provoking way. It is the greater Boston community at its very best! Ready to join now? Click here.